Much like the ever-changing mobile landscape, digital display technology has evolved. No matter where you are, which way you turn — it seems to be all around us, in a wide range of forms and formats, from interactive displays in airports, shopping malls and athletic facilities, to scrolling messaging and signage, found across corporate lobbies, conference rooms, educational facilities and tradeshow environments. 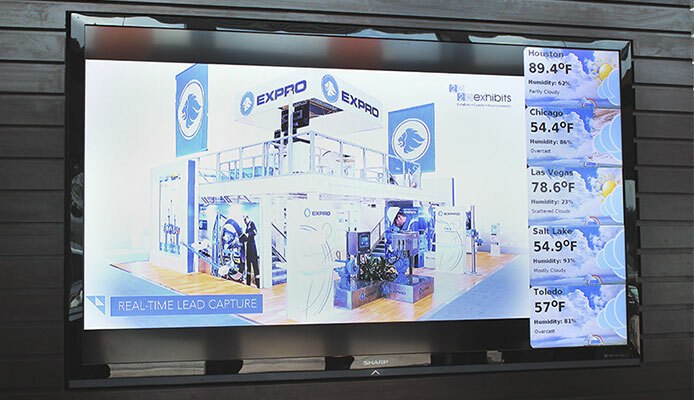 With 2020 Exhibits digital signage display solutions, you can have increased flexibility via messaging and inspiring content. While it may be seen an as often used cliché, its a digital signage truism: The sky is the limit. Our total signage solution goes beyond standard digital signage, offering high performance solid-state devices, free feature-rich software and networking options for turnkey content management and delivery. From daily, location-specific messaging to a broader, more global communication strategy, our digital signage packages can bring dynamic content and technologies to corporate environments and design. If you’re looking for a more dynamic and engaging way to engage and inform your employees, visitors and clients across your business and your brand, we can help. How far do you want to go?